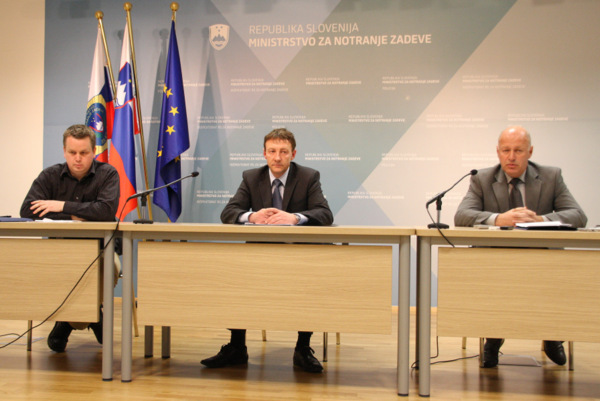 On Thursday, 21 March 2013, the Slovenian Police performed 12 house searches and detained five Slovenian citizens in a coordinated action that concludes the investigation of series of attacks on smaller companies via the internet that started in mid-2012. SI-CERT (the Slovenian national Computer Emergency Response Team) started receiving reports in mid-2012 on attacks that involved malware that upon infecting the victim’s computer logged passwords and installed components for unauthorized remote access by miscreants. The malware was delivered via e-mail and was targeted towards the accounting personnel in SMEs. The content usually warned of a late payment and was constructed in a way that gave the impression of coming from a local bank (in one case even pretended to be coming from the state tax authority and warned about the fictitious change of legislation that would have financial consequences for the targeted victim). The trojan horse that was attached to the e-mail message contacted its controlling server that frequently changed network location. After installing the RAT component (Remote Administration Toolkit) on the victim computer, miscreants would observe the activity on the infected system. With stolen credentials and in the case where the victim did not remove the smart card containing the bank-issued certificate from the reader after use, the doors to the company’s bank accounts were left open to the criminal gang. The attacks usually happened on Fridays or the day before a national holidays. This left enough time for the attackers to queue bank transfer orders unobserved during weekends and holidays, provided that the victim did not shut down the computer or remove the smart card from the reader. The criminal group used 25 money mules to transfer around 2 million Euros. Money mules were recruited with the work-at-home scam in the name of a nonexistent British insurance company. Slovenian police coordinated the investigation lasting several months with the help of SI-CERT and The Office for Money Laundering Prevention which was able to stop many of the fraudulent transactions performed by criminals. SI-CERT performed analysis of the malware and related network traffic characteristics.